Most kids love puzzles because they're fun. However, puzzle play offers many benefits for kids that go far beyond basic entertainment. For example, a study completed at the University of Chicago shows that kids who play with puzzles when they're 2 to 4 years of age develop better spatial skills (the ability to think about objects in three dimensions) by the age of five years than their non-puzzle solving peers. Psychologist Susan Levine, researcher and expert on mathematics development in young children says, "The children who played with puzzles performed better than those who did not, on tasks that assessed their ability to rotate and translate shapes." Levine went on to say that this specific type of ability in kids is an important predictor of children who may choose science, technology, engineering and math courses, degrees and careers later in life. If you need some puzzle ideas, keep reading. 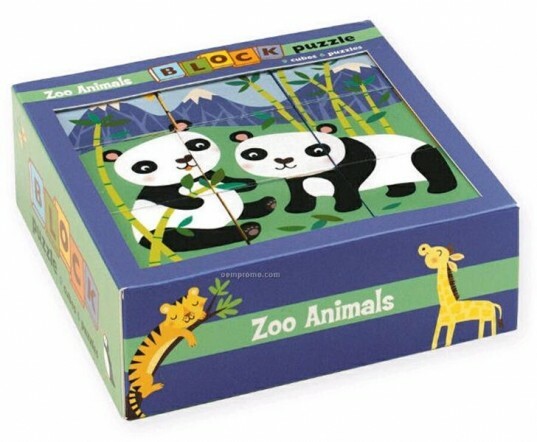 We've rounded up 6 affordable eco-friendly puzzle collections for young children that come in various price ranges to suit different family budgets. Manzanita Kids makes some of the cutest starter puzzles on the planet. These are perfectly suited to very young children, handmade of safe sustainable walnut and finished with homemade local beeswax/jojoba oil. All puzzle pieces are sanded smooth with rounded edges, making their puzzles safe for little hands and each puzzle comes wrapped in brown craft paper, sealed with a Manzanita Kids sticker. The company uses all biodegradable packing material and/or recyclable newspaper to protect their puzzles during shipping. From the lovely Woodland Puzzle shown above to classic puzzle blocks that encourage spelling and counting to sweet little birds and charming stacked critters, Dwell offers puzzle choices for young children in all price and style ranges; all of them in brilliant colors that will enchant young puzzle solvers. Dwell puzzles aren’t the greenest puzzles on the market, but they are safe and made with quality materials, lead-free and made with non-toxic dyes, plus all puzzles meet safety testing standards. Not all toys in the Boikido line are eco-friendly, but they do have a fairly large eco-collection that includes some great puzzles, such as the Wooden Goemetric Stacking puzzle, the Four Seasons puzzle and all the “My First” puzzles. 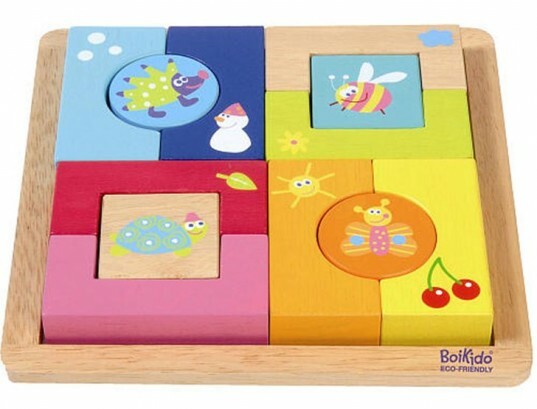 Boikido’s eco-friendly line of puzzles is made with certified FSC wood, water-based non-toxic paints and packaged in recycled cardboard that’s printed with soybean inks. Boikido products are also manufactured in a state of the art environmental friendly factory that utilizes energy saving technology, air filtration and water recycling facilities. 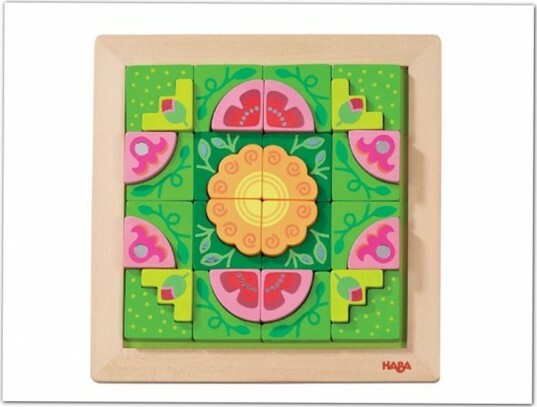 From wonderfully intricate solid wood geometric flower puzzles to geo land puzzles to gigantic cardboard floor puzzles to little wooden discovery puzzles, Haba really offers a little something for every kid in the puzzle department, and their puzzles come in a wide range of prices too. 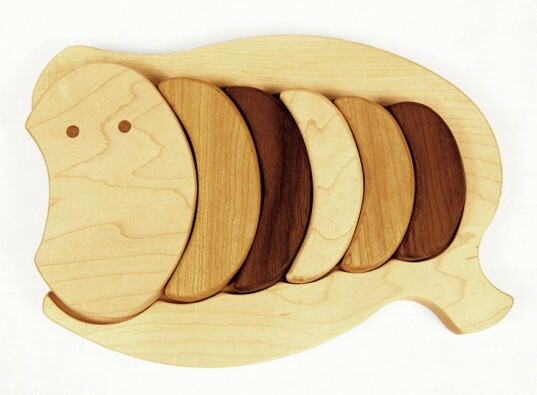 German Haba toys carry the PEFC seal, which means their wood is from sustainable forests and all toys are colored with solvent-free, water-based stains. 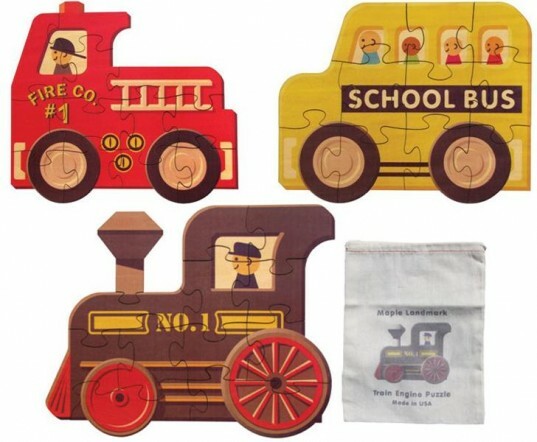 Maple Landmark has some excellent puzzle choices available, such as their newest line of shaped jigsaw puzzles in fun designs like trains, buses and dinos, to name a few. The new shape puzzles are brightly colored with images printed right on the wood, as to not scratch off as easily and they even come with a handy drawstring pouch for storage. They also offer traditional flat puzzles and beautiful vintage-like holiday puzzles – all made of wood. All Maple Landmark puzzles (and other toys) are entirely USA made, keeping your carbon footprint a bit more local. This company also uses smart forestry practices, a wide range of safe wood finishes and they actively recycle and reuse materials. Mudpuppy has many cool products to enjoy, but their puzzles are particularly top notch. Mudpuppy has an unusually large range of puzzle choices to pick from, so you’re sure to find something perfect for every child in your world. Mudpuppy offers shaped “First Puzzles,” extra-thick jigsaws, unique puzzle wheels, awesome 9-piece Two-in-One Puzzles, large floor puzzles and even extra creative “color me” puzzles. All Mudpuppy puzzles are made with eco-friendly greyboard (made from 90-100% recycled paper) and all colors are printed with nontoxic, soy-based ink. Improved memory skills Better hand-eye coordination Proper development of fine muscle movements Better overall math and problem solving skills And more! From the lovely Woodland Puzzle shown above to classic puzzle blocks that encourage spelling and counting to sweet little birds and charming stacked critters, Dwell offers puzzle choices for young children in all price and style ranges; all of them in brilliant colors that will enchant young puzzle solvers. Dwell puzzles aren't the greenest puzzles on the market, but they are safe and made with quality materials, lead-free and made with non-toxic dyes, plus all puzzles meet safety testing standards. Not all toys in the Boikido line are eco-friendly, but they do have a fairly large eco-collection that includes some great puzzles, such as the Wooden Goemetric Stacking puzzle, the Four Seasons puzzle and all the "My First" puzzles. 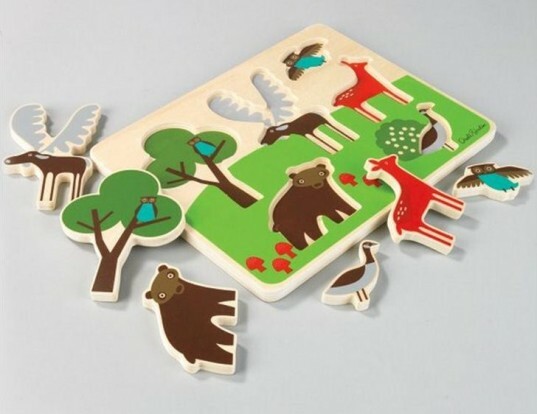 Boikido's eco-friendly line of puzzles are made with certified FSC wood, water-based non-toxic paints and packaged in recycled cardboard that's printed with soybean inks. Boikido products are also manufactured in a state of the art environmental friendly factory that utilizes energy saving technology, air filtration and water recycling facilities. Maple Landmark has some excellent puzzle choices available, such as their newest line of shaped jigsaw puzzles in fun designs like trains, buses and dinos, to name a few. The new shape puzzles are brightly colored with images printed right on the wood, as to not scratch off as easily and they even come with a handy drawstring pouch for storage. They also offer traditional flat puzzles and beautiful vintage-like holiday puzzles - all made of wood. All Maple Landmark puzzles (and other toys) are entirely USA made, keeping your carbon footprint a bit more local. This company also uses smart forestry practices, a wide range of safe wood finishes and they actively recycle and reuse materials. Mudpuppy has many cool products to enjoy, but their puzzles are particularly top notch. Mudpuppy has an unusually large range of puzzle choices to pick from, so you're sure to find something perfect for every child in your world. Mudpuppy offers shaped "First Puzzles," extra-thick jigsaws, unique puzzle wheels, awesome 9-piece Two-in-One Puzzles, large floor puzzles and even extra creative "color me" puzzles. All Mudpuppy puzzles are made with eco-friendly greyboard (made from 90-100% recycled paper) and all colors are printed with nontoxic, soy-based ink.